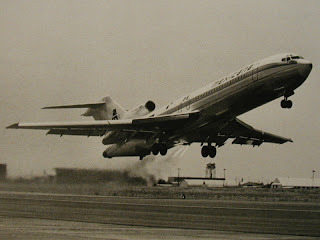 A Mexicana Boeing 727 like this one crashed near Maravatio, Michoacan Mexico on March 31, 1986 killing 166 people. The morning of March 31, 1986, the passengers waiting to board Mexicana de Aviacion Flight 940 milled about the Mexico City gate. As it was Easter weekend soon many of them would take sunny vacations in the Pacific resort cities of Mazatlan and Puerto Vallarta, 2 of Flight 940's stops that morning before heading off to Los Angeles. During maintenance the Boeing 727 that would be serve as Flight 940 was being serviced. Its tires needed air. The ground crew quickly filled the jet's tires so it could be on its way. The passengers boarded the jet and took their assigned seats and got ready for a routine flight. The 158 passengers and 8 crew members didnt know that their jetliner was already doomed and below them was a ticking time bomb. As the jet left Mexico City airspace and entered Michoacan state airspace, some 5 minutes after takeoff, things began to go wrong. As Mexicana 940 reached the altitude of 22,000 feet, one of the front landing gears exploded. The tire's blast severed important cables and crippled the plane's navigational system. A blaze soon erupted in the undercarriage. The plane began to lose altitude. The only signs of trouble were the Pilot requesting Mexico Air Control Center permission to lower their altitude. Then the plane started to lose pressure. Thick, acrid smoke was starting to waft up from under the jet and into the cabin. Passengers quickly started to panic as stewards tried to calm them. "Mexico ACC, Emergency. Mexicana 940. Request return to Mexico (City)"
Mexico Tower acknowledged their request. "Descend to 200, Mexicana 940. Turn Right, direct to Mexico VOR". Guadarrama confirmed "Mexicana 940, direct right to Mexico VOR". Those were the last words from Flight 940. At 9:09 AM Mexico Tower radioed MX940: "Mexicana ACC, Mexicana 940, answer if you hear this..."
Something was happening over the skies of Michoacan state near the town of Maravatio. Shepherds and farmers on Pomoca Ranch near El Carbon Mountain saw the White and Gold livery jetliner quickly plummet, flames and smoke trailing from the back. Inside the cabin, all was panic. 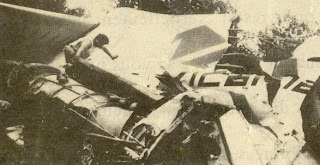 Passengers in desperation tried to seek refuge in the cockpit. The jetliner exploded in a roar, before the eyes of stunned eyewitnesses. Two flaming pieces falling on 9,000 ft. El Carbon Mountain, the Tail section and the severed cabin crashing in flames into a ravine, exploding once again, scattering wreckage, luggage and bodies all over the mountain. The first people on the scene were Michoacan state highway police who reported "No survivors". Charred bodies and body parts littered the landscape. The crash had started a few small brush fires and a plume of white smoke marked the site of Mexico's worst aviation accident to date. Red Cross teams soon began the gruesome task of recovering the bodies. Due to the rugged terrain, a special platform had to be built uphill so that rescue choppers could land. Volunteer farmers and paramedics would tediously carry the bodies in plastic bags and stretchers up to the choppers where they would be flown to Maravatio and then transported in ambulances to the state capital of Morelia for identification. 166 persons in all, among them 9 Americans had perished. The bodies, ID'd and covered in lime inside three hangars at the Morelia airport, would be flown in coffins, ironically in another Mexicana jet, back to Mexico City to be claimed. Four days after the crash an obscure Lebanese terrorist group issued a letter claiming responsability for the "bombing of Mexicana 940". They claimed they had blown the jet out of the sky with a suicide bomber out of their beef with the United States. Why they had chose a Mexican jetliner on Mexican soil was a big question. On April 1st, TWA 840 had been bombed in Athens, killing 2. The group also claimed responsibility for that attack. The claim was soon dismissed as hogwash. Then there were more rumors. Israeli spies had been on Mexicana 940, booked under fake names. That the Miguel De La Madrid administration had bombed the jet deliberately to distract public attention from the countries woes. The real cause of the accident was a fatal mistake traced back to Mexico City airport. Before departure, the planes tires had been filled with pressurized air. Airplane tires must be filled with Nitrogen, not pressurized air which causes tires to burst when they reach certain altitude. I know you post this entry like a year ago, but I really like to talk to you about this plane crash. I lost 5 of my family members in thise crash, so I would love to have more information, pictures, new, everthing. Im looking for the passenger list, anyone has it? Pretty sure youre a scam artist and full of crap. I was traving home from Puerto Vallarta on Easter Sunday March 30 1986, with my parents and friend when I lost my immigration form. Because I entered Mexico in Guadalajara they when flight 940 on that day stopped in Mazatlan they would not allow me to reboard the aircraft. My parents stayed with me in Mazatlan that day and my friend continued on to LAX. The next morning March 31, 1986 I went to immigration received my visa and we then went to the airport to catch Mexicana flight 940 to LAX. During the 3 hour delay it was not until boarding the replacement aircraft another American behind me in line told me his taxi driver told of the Mexico City to Puerto Vallarta crash and the aircraft that was suppose to pick us up. Thanks for this. My brother's grade 5 teacher was on this plane, one of two Canadians. AYOO BERGABUNG BERSAMA KAMI SITUS ADU Q, HANYA DENGAN MODAL 10RB ANDA DAPAT MERAIH KEUNTUNGAN HINGGA JUTAAN RUPIAH DALAM WAKTU SINGKAT.